Have you ever seen a mantid that lives exclusively on the ground? Most mantids are ambush predators, hiding amongst the bushes while patiently waiting for unsuspecting prey to happen within striking range. However, a few small groups of mantids have adopted a different strategy – running down their prey! One such group is the ground mantids, represented in the U.S. by two genera – Litaneutria and Yersiniops. 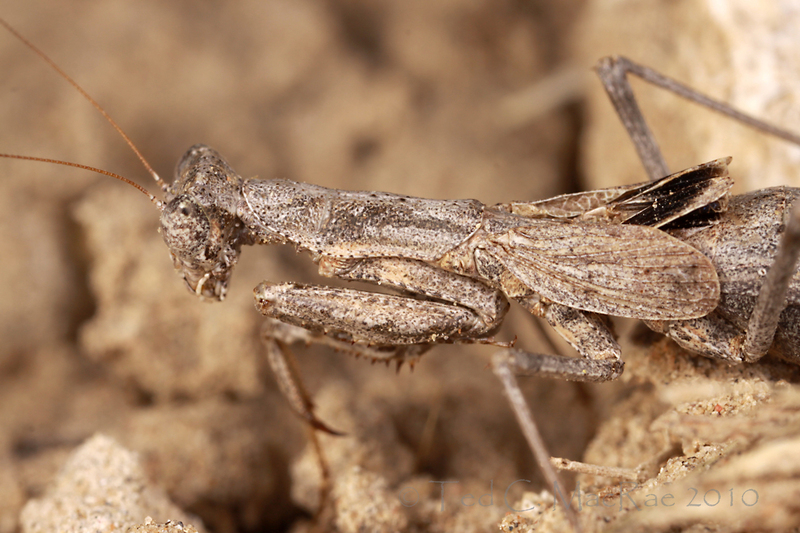 These small mantids, cryptically colored brown or gray, occur in desert and grassland habitats across the western U.S. This particular individual was seen in the expansive shortgrass prairie atop the Pine Ridge in northwestern Nebraska. The rounded eyes and brown coloration identify it as as a member of the genus Litaneutria (the tops of the eyes are pointed in Yersiniops, giving them a “horned” appearance, and they tend to be more gray). Two species of Litaneutria are found in the U.S. – this one, L. minor, occurring broadly throughout the Great Plains and western U.S. into southwestern Canada (it is Canada’s only native mantid), while a second species, L. obscura, is restricted to the desert southwest.¹ Several common names have been applied to L. minor, including lesser ground mantid, minor ground mantid, and agile ground mantid. While the first two represent more precise literal translations of the scientific name, I like the latter which well describes the ability of these mantids to hop over rocks and dart swiftly through sparse prairie vegetation in pursuit of prey or to evade predators (and inexperienced collectors!). Despite its small size (total length less than 1.5″), the presence of wings – albeit small – indicate this is an adult. All females of this species are brachypterous (short-winged), but most males are as well. However, males apparently have a small spot at the base of the forewings, which seems lacking in this individual, and a smoother pronotum – also not readily apparent in this individual, so I’m guessing that this is an adult female. ¹ BugGuide and many other web sources list five additional U.S. species in the genus (including L. borealis, described from northwestern Nebraska). However, Vickery and Kevan (1983) note that these were all synonymized under L. minor by Hebard in 1935 (sorry – I couldn’t find that reference). “Mantid” vs. “mantis” vs. “praying mantis.” It has become common to use the terms “mantid” and “mantis” (or even “praying mantis”) interchangeably. However, in its strictest sense the term “mantis” is most properly applied to species of the genus Mantis – of which Mantis religiosa – the European mantid or praying mantis, introduced to the U.S. in the late 19th century (either accidentally on a shipment of nursery plants or deliberately for pest control – depending on the source) is the most widely recognized. The term “mantid” refers to any species in the suborder Mantodea as a whole. Carnivorous cockroaches! When I was in college back in the late 1970s, mantids and most other “orthopteroid” insects had long been considered suborders of a single order, the Orthoptera. Around that time began a great dismantling of the Orthoptera, pared down to only the grasshoppers, crickets, and katydids while the other former suborders (mantids, walkingsticks, cockroaches, etc.) were raised to full order status. The walkingsticks (Phasmida), grylloblattids (Grylloblattodea), and gladiators (Mantophasmatodea) all continue to enjoy their elevated status (Tree of Life Web Project 2003); however, a close relationship has been established between the mantids, cockroaches, and termites² (Kristensen 1991), resulting in the sinking of all three former orders into a single order, the Dictyoptera (Tree of Life Web Project 2002) (and not to be confused with the lycid beetle genus Dictyoptera). Mantids, thus, can be considered derived cockroaches with morphological specializations for predation! ² Long accorded an order of their own – the Isoptera, recent molecular phylogenetic studies have placed termites not only with the cockroaches, but within them (Ware et al. 2008). Just as mantids can be considered cockroaches that evolved as predators, termites can be considered cockroaches that evolved to eat wood (with the help of cellulose-digesting gut symbionts)! Kristensen, N. P. 1991. Phylogeny of extant hexapods. Pp. 125–140 in Insects of Australia: A Textbook for Students and Research Workers. Volume I and II. Second Edition. I. D. Naumann, P. B. Carne, J. F. Lawrence, E. S. Nielsen, J. P. Spradberry, R. W. Taylor, M. J. Whitten and M. J. Littlejohn eds. Carlton, Victoria, Melbourne University Press. Vickery, V. R. and D. K. M. Kevan. 1983. A monograph of the orthopteroid insects of Canada and adjacent regions. Lyman Entomological Museum and Research Laboratory Memoir 13:216–237. This entry was posted in Dictyoptera, Mantidae, Mantodea and tagged crypsis, entomology, insects, mantids, nature, Nebraska, predator avoidance, science. Bookmark the permalink. My understanding is that “mantid” in the strictest sense refers to species of the Mantidae rather than the whole Mantodea. However, as “mantid” is in wide use as a common name for these critters we should maybe refer to members of this family as mantid mantids? Or we could refer to the Mantodea as “mantodes” (pronounced man-toads – hmm, somehow I don’t think that’s going to catch on!). Have you ever seen a mantid that lives exclusively on the ground? Yes, I do! In arid areas of southern Spain is not uncommon Geomantis larvoides Pantel, 1896, a mantis/mantid/predator cockroach with a very similar behavior. Apparently this ground running – or cursorial – strategy evolved at least three times from the basal generalist strategy (waiting on tree trunks and then running after prey when spotted). All of the groups that have adopted the cursorial strategy seem to live in dry/xeric habitats with little non-herbaceous vegetation, suggesting the transition of habitat from woodlands to grasslands was a key driver selecting for this strategy. The ambush strategy, by contrast, apparently evolved only once but is now the most commonly used strategy in the group. Interesting – a family of snout mites, Cunaxidae, has a similar split between ambush and cursorial predators. In the mites, the runners take a wider range of prey compared to the ambushers (at least in the lab) since they aren’t dependent on movement to trigger an attack. It looks like Ware et al. recovered a monophyletic Mantodea and the same for Blattodea-Isoptera, so I’m not sure why mantodeans don’t get their own order. I guess I should read the paper: some colleagues are redoing some exhibit labels and I know this group has always been problematic. If so, then treating Mantodea as a separate order or a suborder of Dictyoptera is more a matter of taste or fashion than anything else. If it weren’t for the display labels and queries from the public, then it wouldn’t matter much here. I usually avoid such problems by ignoring rank and calling them ‘groups’, but some people need their ranks and miss their mantid and cockroach orders. Yes – there was the same resentment towards giving them separate order status back when I was in school. People are always resistant to change. Me, I’m pedantic enough to take an interest in whether this or that is classified as an order, suborder, supertribe, etc. In a dark sort of way, I actually get a kick out of having to update collection inventories when the classification changes – it reacquaints me with groups I may not have paid attention to for awhile. Thanks for the info! I see these from time to time, and now will be taking a second look at them when I do. If you see any with a “horned” appearance (genus Yersiniops), they are quite photogenic when viewed face-on! Gorgeous shot of a handsome critter! And I’m delightfully surprised to learn of one that lives on the ground. That’s a pleasant surprise. To reiterate what Gunnar said and ask a question about it: I thought recent taxonomic changes had reorganized Mantodea such that several of the sub-families had been promoted to family status. My impression of that was, if we follow the usual nomenclature, “mantid” now only applies to members of the family Mantidae and “mantis” applies to everything in Mantodea. Since I’m no taxonomic expert (at all! ), is that more in line with the usual approach or are we grandfathering “mantid” because it’s such a common part of the vernacular? The problem with this particular case is that a colloquial common name exists for the Mantodea (mantid) that is precisely the same as it would be had the common name been derived from the family name (when all mantids were placed in the family Mantidae). Normally, in taxa that lack colloquial common names, a “common” name is derived from the family name simply by dropping the ae at the end of the name – so Mantidae are mantids (the “true” mantids), Toxoderidae are toxoderids, Hymenopodidae are hymenopodids, etc. In this particular case, because of the elevation of Mantidae to Mantodea, we now have a common name – mantid – that refers technically to a specific family and colloquially to the higher taxon that contains it. I’m not sure what, if any, “rules” apply in cases like these (I think “aphid” might bring up another such conundrum, as the former Aphididae have also been split into numerous families). What is clear is that whether one uses “mantid” or “mantis” everyone knows what they’re referring to.